Sometimes you need a reminder that people really are wonderful. 1. The dad who turned his hospitalised newborn into Iron Man with a DIY costume. 2. The #Illridewithyou campaign that aimed to help Muslim commuters feel safe in the wake of the Sydney siege. 3. The crowd who spontaneously joined this little girl's dance at a NYC subway stop. 4. And the guy who started his own dance party on a Perth train. 5. The Santa who express-posted this man's lost wallet back to him in time for Christmas. So guess which idiot lost his wallet in Hobart last week. Hint: The same idiot now believes in Christmas miracles. Hint: The same idiot now believes in Christmas miracles. 6. And the Santa who learned sign language to communicate with this deaf little girl. 7. 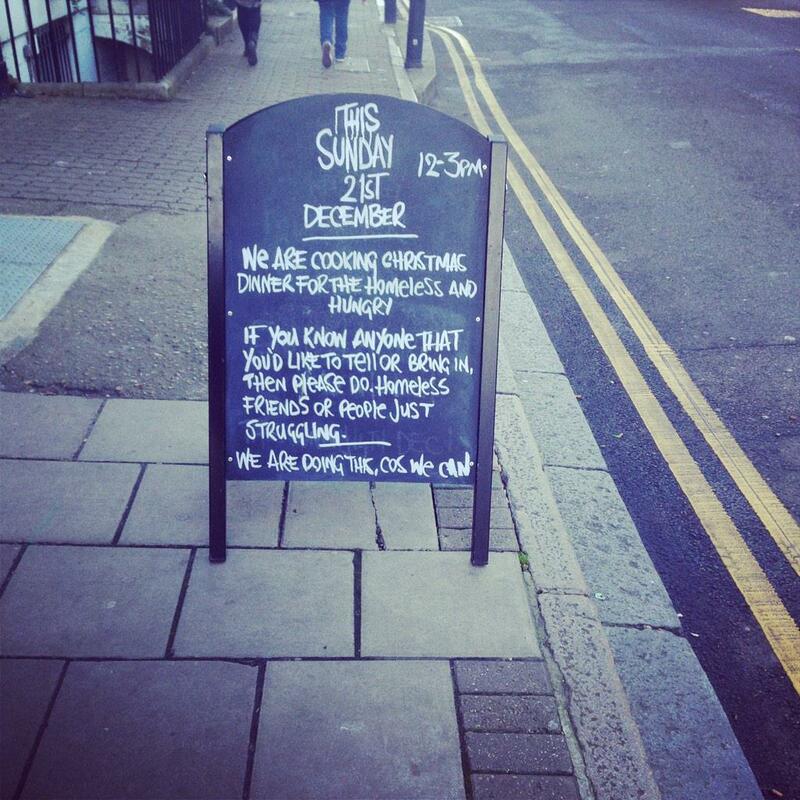 The London pub that made Christmas dinner for the "homeless and hungry". 8. The man who modified toy cars to help give disabled kids mobility - and started teaching people how to do it at home so everyone can access the tools he created. 9. The woman who designed 3D printed prosthetics for Derby the dog - who was born with deformed front legs - enabling him to run and play. 10. The Reddit user who gave his girlfriend a jar of 365 love notes - so she could have a good start to each day of the year. 11. The tattoo artist who gave this woman with Down Syndrome a fake tattoo every Friday. 12. The town that celebrated the holidays (including Halloween and Christmas) over one week in early October so that four-year-old cancer patient Ethan, who only had weeks to live, could take part. 13. The commuters who worked together to free a man wedged between a train and the platform. 14. 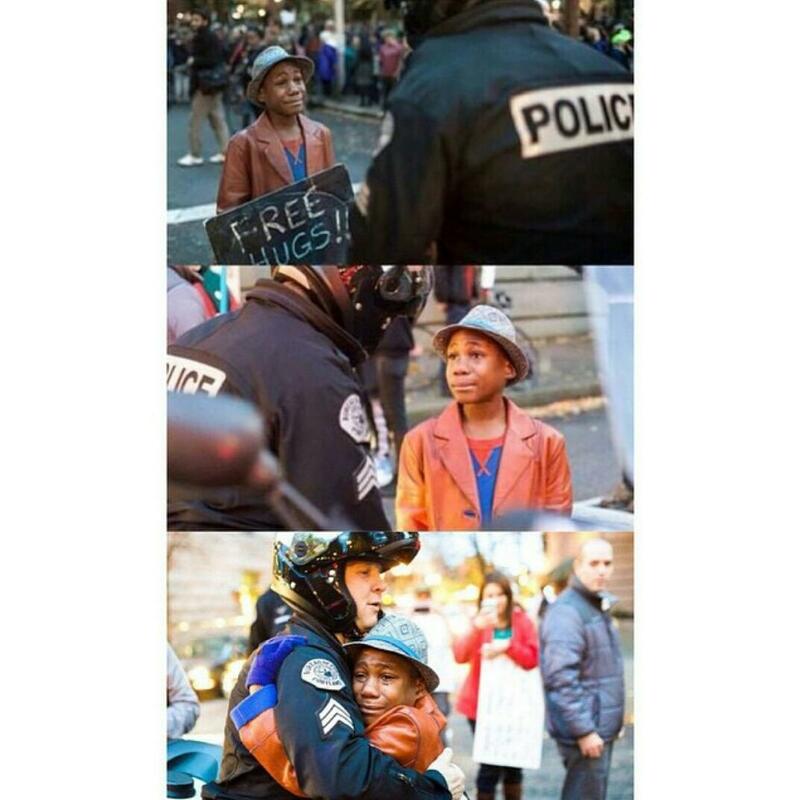 The 12-year-old boy who offered free hugs at a Ferguson protest and embraced this police officer. 15. The Reddit users who helped this man attend his son's high school graduation, after he posted that he couldn't afford to travel the 300 miles to get there. 16. The little girl who wrote this letter to her teacher after he came out as gay. 17. And the reaction of this 13-year-old when his best friend came out via text message. 18. The friends who helped this deafblind Brazilian man experience the World Cup in real time. 19. The seven-year-old who set up a lemonade stand to raise money for his best friend's surgery for cerebral palsy, and raised over $60,000 with the help of the community and the internet. 20. And the six-year-old who wrote a book for his best friend with a rare liver disorder, and raised over a million dollars for research into the disease after copies were sold for $20 each. 21. The parents who made a video celebrating their transgender son with the aim of promoting awareness and acceptance. 22. And the family who issued a new birth announcement for their transgender son. 23. The dad who helped his 12-year-old daughter with mitochondrial disease dance her way through pageants. 24. The little boy who took it upon himself to feed stray dogs every day. And his dad, who helped him build an animal shelter in their garage after discovering what his son had been doing. 25. The basketball team who officially signed a five-year-old fan with leukemia to play with them for a game. 26. The students who pitched in to buy their school janitor tickets to the Red Hot Chili Peppers concert. 27. The three-year-old girl who decided to cut off her hair (and give Rapunzel a matching cut) so it could be made into wigs for children with cancer. 28. The scientists who invented a device that reroutes brain signals, enabling this quadriplegic man to move his hand with his mind. 29. The bus driver who stopped his bus, which was full of passengers, to comfort a bullied girl he saw crying on the footpath. 30. The community who not only helped clean racist graffiti off this mosque, but also posted messages of support. 31. And the people all around the world who sent treats to this little boy and his dying service dog, Bingo, to help them fulfill Bingo's "lick it list".